This is a Greco guitar that I've borrowed from my nephew. He wants to sell it so I've been scouring the internets and cannot find any info on it at all. It's a Jag copy but that's all I know. How much is this thing worth? He paid around 350 for it and it's near mint. I think 250-300 would be pretty reasonable. Looking at ebay, prices are all over the place for Grecos- Firebirds are going for 1300, others 200. The internets have failed me though when it comes to the jag copy. Are these numbers US dollars? Greco was the name they Fuji Gen Gakki used in Japan, so it might equate to an Ibanez model (although it doesn't look like any i've seen) which would help the salability. I'm thinking it's from the 70's, but it isn't one of the spot-on copies that people get all goofy over, so probably post lawsuits. Is there any model number identification (should be 4 digits)? without any further ID, i would price it at about $350, but it has mostly curio value, not collectability. ok, to add to the confusion, they were imported into the US by Goya/Avnet, which might explain how it got out of Japan. Which is useless trivia, but might as well fill out the story. I saw no ID number on it anywhere and didn't want to take it apart (I've since returned it). Didn't sound too bad when I played it and the string mute is fully intact (unlike the mute on the Jag in the background which has disintegrated). 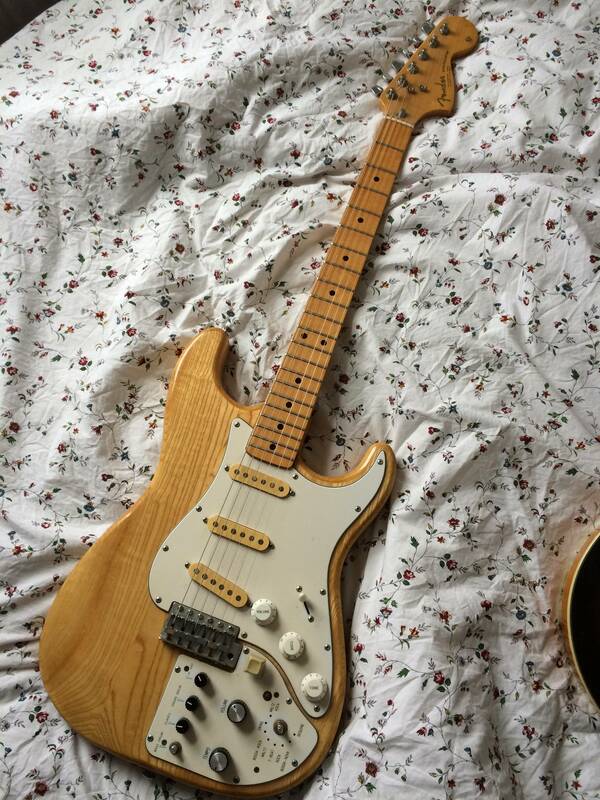 hey nerds, my friend ended up with this very odd thing in his possession - a fender strat with a built-in drum machine. anyone know anything about it? or is it a pretty professional-looking diy job? as discussed on another thread, a particular chord in a particular song I want to learn requires I fret the top two strings at the 14th fret with my little finger & I just can't do it - no matter how I place my finger and how hard i press I can't get a remotely clean sound. now other fingerings are available, HOWEVER I had a go with two other different guitars at the weekend and i had much more success. it was suggested I take my guitar to a luthier to lower the action or otherwise tinker with the set up. is this likely to be a worthwhile strategy? Not unless the action on your guitar is unreasonably high. And you don't need to go to a luthier to adjust that. I've never thought it's painfully high but if it's making it too hard to fret certain chords then that's not ideal. Generally the best way round this is to buy a prohibitively expensive guitar. Or, more likely, not. Go get a setup. Shouldn't cost much, and if it doesn't need it the setup guy will tell you, unless they're a jerk. how important is it to play it so high in the neck? can't you play it in a different octave? Are you playing acoustic? Without a cutaway? I would like to get a setup but in all honesty it's prob pretty low on my list of time consuming things to do on the rare occasions I get some me time. I measured my action and it seems average, also I have had slightly more success with that chord recently, no idea what's changed. So I'll just soldier on for now. I could play it in a different key I guess but y'know it wouldn't feel right.